If you are considering a career in the health care industry, then you may be interested in how to become a phlebotomist. In order to do this it is important to understand exactly what the job entails and what sort of qualifications and training is required. You can find out everything that you need to know in the following guide on pursuing this particular career. If you are researching how to become a phlebotomist, then perhaps you already know what this job actually entails. However, for those who do not already know, a phlebotomist is a healthcare professional who is trained to draw blood from patients. They are responsible for ensuring that this is done in the safest way possible so as not to either harm the patient or contaminate the blood they have drawn. The reasons for a phlebotomist to draw blood can vary. It may be that the patient needs to submit samples for blood tests or it could be that they are donating blood. Whatever the reason, it is the phlebotomist’s job to ensure that the blood is drawn in a sanitary manner which presents no danger to the patient. Where Can A Trained Phlebotomist Work? One of the biggest questions that many people researching phlebotomy work is where they would actually be able to work once they are fully trained. There is a very simple answer to this particular question – anywhere! If we want to be more specific about this answer then basically anywhere that medical procedures are practiced there should be a job for a phlebotomist. The list of locations where a trained phlebotomist might be based is long and includes hospitals, doctor’s clinics, laboratories, blood banks, retirement facilities, rehab clinics, emergency crews on ambulances, ships, mobile hospitals, free clinics and many more. There is also the opportunity to work overseas in areas that are in need of aid such as many African countries. There are also scientific outposts all over the world and a number of charitable organizations like the Red Cross where phlebotomists could potentially find work. So now that you know what a phlebotomist is and where one might find employment the next step is to find out the process of how to become a phlebotomist. In this section you will be able to find out what level of education is required, how much additional training is required and how long it takes to get fully qualified. The first step in actually becoming a phlebotomist is to earn yourself a high school diploma or an equivalent qualification such as a GED to signify that you have completed your education to a high school level. While this is not necessarily a formal minimum requirement for the job, you will find that many institutions will insist on this as a prerequisite for entering the phlebotomist training program. It is worth noting that you must legally be at least 18 years of age to enter a phlebotomy training program, so it is worthwhile staying in school to earn that diploma anyway. On graduating from high school, or earning an equivalent diploma, the next step is to enroll in a college or technical school that offers a phlebotomy training program. These courses are generally fairly short term especially when compared to the length of study required for other health care professions. It is possible to complete the required period of study to be a phlebotomist in less than one year. The training will include various elements including how to draw blood safely, general lab safety, how to interact with patients appropriately, safe disposal of needles and other equipment, and also training on related legal issues that could arise during the course of your employment as a phlebotomist. This training should incorporate a combination of classroom study and practical training in a clinical setting. In order to complete a phlebotomy training program students will need to demonstrate their proficiency in completing various disease tests and skin punctures. On completion of the appropriate training students have the option of becoming a certified phlebotomist. If you wish to actually take a job as a phlebotomist then this is essential in many states. There are a number of governing bodies who can provide certification and each of them have their own individual requirements as detailed below. American Society of Clinical Pathologists – There are actually 7 different routes that can be taken to gain certification as a phlebotomist with the American Society of Clinical Pathologists. Full details of these pathways are found on page 5 of their Procedures for Examination &mp; Certification brochure, but as an example one of the paths requires high school graduation (or equivalent), completion of an approved phlebotomy program in the past 5 years which includes 40 hours of classroom time and 100 hours of clinical training with a minimum of 100 successful unaided blood collections. American Medical Technologists (AMT) – In order to be certified as a phlebotomist by the American Medical Technologists, also known as AMT, an individual not only has to have completed a recognized training program, but they must also have racked up a minimum of 1040 hours of work experience and pass a written exam. American Association of Medical Personnel – In order to be certified as a registered phlebotomist by the American Association of Medical Personnel an individual is evaluated by an organization of peers who will confirm that that individual adheres to a code of ethics, can pass an assessment to show competency and is committed to continuing their education in the field of phlebotomy in order to stay current. American Society of Phlebotomy Technicians – The requirements to be able to sit the certification exam with the American Society of Phlebotomy Technicians individuals must have completed one year working as a phlebotomist part time or 6 months working on a full time basis. They will also need a letter from a supervisor confirming that the individual is required to drawn blood regularly and this must be on headed paper from a recognized health care facility. The individual should have successfully completed an accredited training program with 100 successful venipunctures and 5 skin punctures which must all be documented. 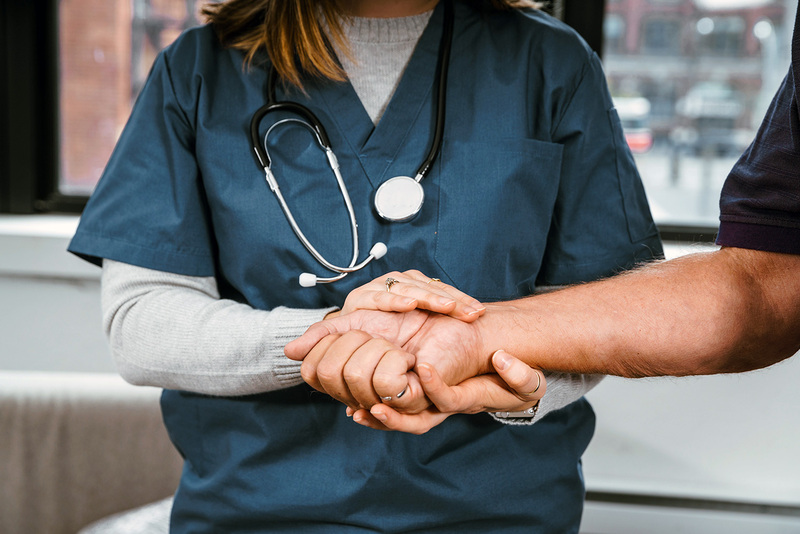 The latest statistics from the U.S. Bureau of Labor Statistics indicate that phlebotomists are currently very much in demand, so there are plenty of job prospects out there at present for phlebotomists. The news is better still for anyone interested in a phlebotomy career because there does not seem to be any sign of this demand dropping at any point in the foreseeable future. In terms of earning potential, there is a huge variation depending on experience, work environment and even which state you work in. On average, the wage range for phlebotomists ranges from slightly above minimum wage up to around $40,000 per year. As of June 2014, the median wage for a Phlebotomist in the United States stands at $30,934 meaning that half of all practicing phlebotomist across the country can expect to earn less than this amount (see fig.1). By now you should have a fairly good idea of how to become a phlebotomist, but there is still the question of whether or not you are actually suited to this type of work. What sort of person does it take to be a phlebotomist? One of the key skills that is required of a phlebotomist is a desire to work with people. This is very much a service based job where you will be dealing with people on a daily basis. You will need to be able to communicate with patients who might be anxious or afraid of having blood drawn. I short, if you are not a people person then this is probably not a career that you should be exploring. It is also useful to be empathetic as this will allow you to reassure patients who are not comfortable with the process of giving a blood sample. In terms of physical traits, hand eye co-ordination is a must. You will need to be able to accurately locate the appropriate location to insert a sharp instrument in order to draw blood. This also requires a steady hand. There is no room for error in this profession. With that in mind, perfect vision is also important to allow the phlembotomist to read charts and instruments with small scales. You will also want to ask yourself how well you can work under pressure. In the medical profession there will frequently be times when the job becomes stressful. A Phlebotomist could be called upon in an emergency situation, or be asked to draw blood from a hostile patient. In addition to this the job often calls for long hours and irregular shift patterns – especially for newly trained individuals. This can place additional stress on a person. A Phlebotomist also needs to be responsible. It is down to these people to protect the safety and well being of patients while drawing blood. Now that you know how to become a phlebotomist, the next logical question is where can you find work once you have completed your training and earned your certification. The best place to start looking for employment is probably within hospitals and healthcare clinics as these are where the largest percentage of phlebotomist job opportunities are found. However, you may also wish to try your luck in clinical laboratories although this work will be centered more around screening and testing collected blood samples than dealing with patients as you would in a hospital environment. The table below (figure 2) shows the industries which offer the highest levels of employment, the highest concentration of employment and which industries pay the highest wages for phlebotomists. When thinking about how to become a phlebotomist and where to find such employment, aside from looking at the various industries that might offer employment it is also important to look at locations. 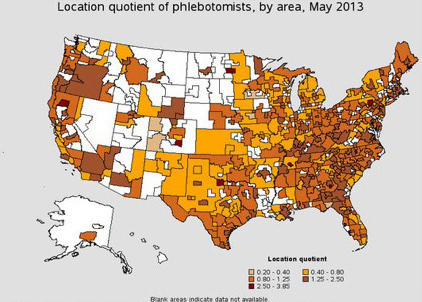 The data presented in figures 3 and 4 below shows where the highest concentration of phlebotomist job opportunities in the country can be found with the top cities being highlighted. It is interesting to note that the largest volume of job opportunities for trained phlebotomists seems to be concentrated on the east coast. This could mean that you need to relocate in order to find work as a phlebotomist if for any reason there appears to be a lack of work in your local area within this particular area. Hopefully this guide has provided you with all of the information that you need regarding how to be a phlebotomist. To summarize, you will need to be at least 18 years of age and a high school graduate (or hold a GED or similar). You will need to complete approximately one year of training at a technical school or college and then preferably seek certification in order to enhance your prospects. The payscale for phlebotomists varies by location and other factors, but this is a career which always has a high demand.